Why wait around for your money when you can transact now? Instead of taking records off the blockchain and raising the chances of record discrepancies or questionable motives, GoldCoin scales on-chain by using the originally specified standard: 0-Conf. The GoldCoin protocol broadcasts messages about payments that haven’t made it into the blockchain yet. This feature was abandoned in Bitcoin and is no longer possible due to network congestion and replace-by-fee, or RBF. Even though 0-conf transactions haven’t formally been inserted into the blockchain record, they’re still in the official network instead of a private, compromisable sidechain. In essence, they’ve just received zero confirmations. When trying to generate a block, a network node only accepts the first version of a transaction it receives for incorporation into the chain. If you broadcast a transaction and someone else broadcasts a double-spend at the same time, then it’s a race to propagate to the most nodes first. If one has a slight head start, it will geometrically spread through the network faster and win the race. Regardless, most merchants will use payment processors. The payment processor has connections with many nodes. When it gets a transaction, it blasts it out and simultaneously monitors the network for double-spends. If it receives a double-spend on any of its many listening nodes, then it can alert the merchant that the transaction is bad. A double-spend transaction wouldn’t get very far without one of the listeners hearing it. The double-spender would have to wait until the listening phase was over, but by then, the payment processor’s broadcast would have reached most nodes. In other words, it’d be so far ahead in propagating that the double-spender would have no hope of grabbing the needed percentage of remaining nodes. For most merchant transactions, 0-Conf is a perfectly safe method of processing a transaction. For big-ticket items, such as automobiles, the merchant could simply wait the two minutes for the first confirmation before delivering the item. In either case, the risk will be much less than the rate of chargebacks on verified credit card transactions or that of returned checks. The Goldcoin Telegram Group is a great place to learn more about Goldcoin and participate in our growing community. Goldcoin (GLC) is a scrypt-based cryptocurrency based on the original Nakamoto protocol. It is both digital Gold and digital cash. It is a high value platform intended to be a lasting foundation for the world’s financial system. It’s Digital Money for a New Generation. New Currency - New Lifestyle! Bitcoin is a revolutionary invention of the last decade. Its essential meaning is money digitization. It became the first decentralized peer-to-peer payment network for using without any central authority or middlemen. In a nutshell, bitcoin is the money for Internet. Its original purpose is providing all people with universal currency for different operations. Bitcoin can also be described as the most prominent triple entry bookkeeping system in existence. There are two ways to buy bitcoins: with a credit card or on an exchange. Bitcoin was partnered with Simplex to make buying with it card easier. At bitcoin exchange users can buy and sell bitcoins after setting up an account. Making a decision depends on how quickly you want to complete the transaction. There are different fees and terms. Download an app or program Bitcoin Wallet which allows you to send and receive bitcoins. There are many wallets across various platforms. While their features vary, their functionality remains. Once your wallet is downloaded and activated you can add some bitcoins via credit card or with a Bitcoin Exchange. Keep your private key secure and never lose the device on which the wallet was installed. The process of sending bitcoins is very easy. In two words, you need to send receiver's public Bitcoin address in your wallet, specify the amount, confirm address and send. Cryptocurrency isn’t a bank, so why pay to use what you already own? Good cryptos depend on great technology. GoldCoin’s network is stability exemplified. GoldCoin’s network foundations are designed to protect its user community. Adaptive optimization of proof-of-work lets GoldCoin meet demand intelligently. 51% attacks cripple countless crypto coins. GoldCoin’s code fights back. Whant to Know More About Bitcoin? 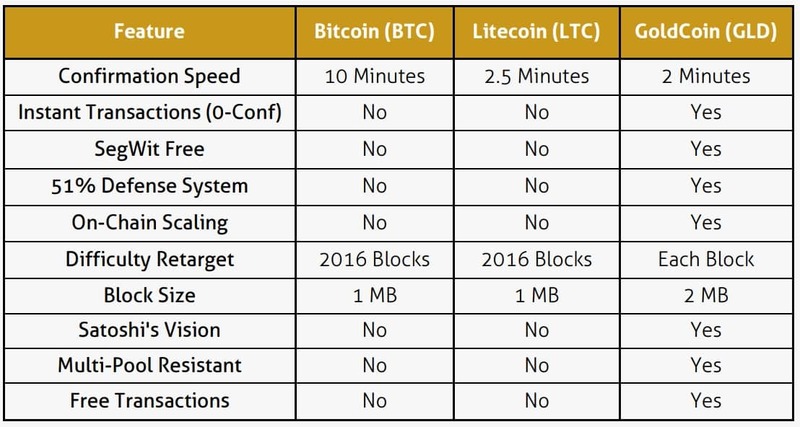 What I liked about GoldCoin (GLC) is that it’s been around for 5 years, fees are really low and faster confirmation times than all other Crypto coins, 51% defense system and open source community driven coin… Only thing is its a undervalued coin. Not a clone coin and has the potential to rival the big coins. Biggest moon potential of all the coins I researched. Been trading for about a year. Used to trade all coins but settled for Goldcoin in the end. Excellent! I’ve never had problems with transactions and it’s fast. Goldcoin was the first cryptocurrency I mined for. I have stopped mining and instead, I’ve decided to highly collect Goldcoin. It’s consistent and reliable and the developers are always active. Millions of people have made a fortune with bitcoins! Check current exchange rates and make your profit from buying/selling bitcoins!